This Ceramic Coated Knife Sharpener is the perfect tool for keeping all your kitchen knives, and scissors in top shape. To get the most out of your knives you'll need to keep them in tip-top condition, and this Ceramic Coated Knife Sharpener is your kitchen’s preferred choice. Ergonomic Solid ABS plastic handle, whether left-handed or right-handed, you can sharpen kitchen knives by holding the handle firmly. 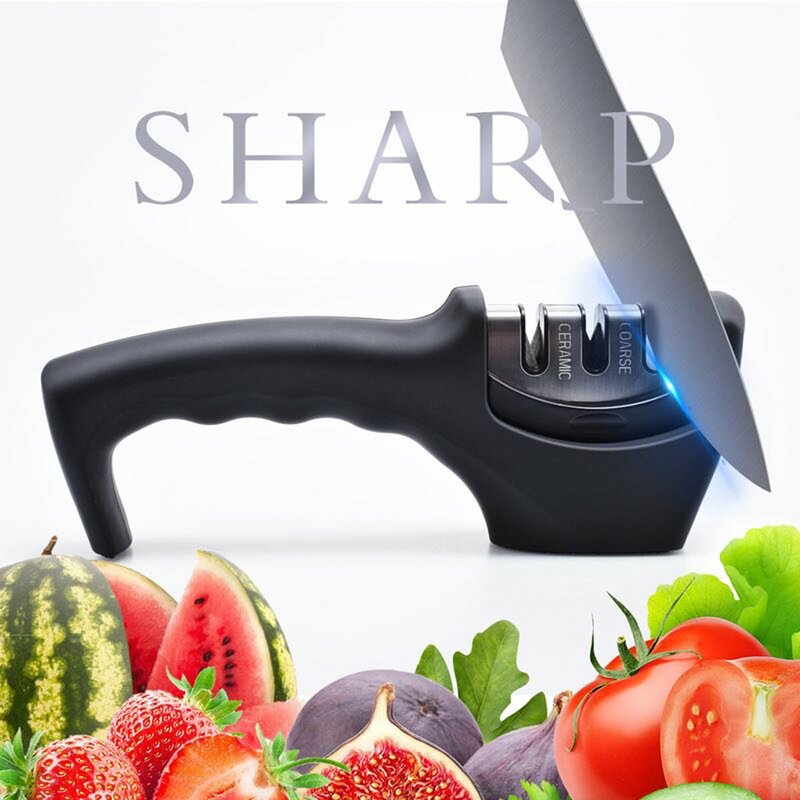 Your kitchen shouldn’t be without this kitchen knife sharpener! SMALL & EASY TO USE: This knife sharpener is easy to use. Simply position the dull blade on the sharpening slot and enjoy razor-sharpness in just seconds. It is very suitable for manual operation. SOLID AND EASY TO CLEAN: The Chef Professional Knife Sharpener works simply, easily, effectively, and all without removing more blade metal than necessary. You can take the sharpener head out by pressing and pulling the small groove, then clean it with flush water. SAFE AND RELIABLE: Anti-slip base ensures a steady and reliable performance, ergonomic handle offers a secure and comfortable grip. Non-electric, so you don’t need to worry about the leakage of electricity. WIDE RANGE OF APPLICATION: Use it sharpen Scissors and Hunting Knives too! - Do not give too much press during sharpening process, neither pull your knife back and forth in the grinder slots, or you will damage the blade. - After sharpening your knife, wipe the sharpener with a damp cloth or rinse with water, then wipe dry with a soft cloth to clean the metal part and ceramic rod. - Keep the sharpener or knives out of reach of children to avoid accidents. - This knife sharpener was designed for straight-edged knives only, it does not suitable for serrated knives.